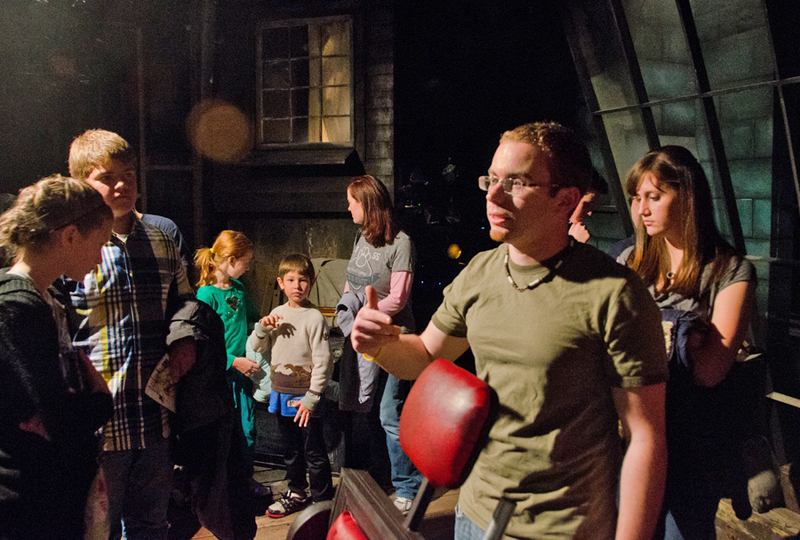 Theatre student Ryan Stanger, who is the show’s technical director, shows the workings of Sweeney Todd’s barber chair. 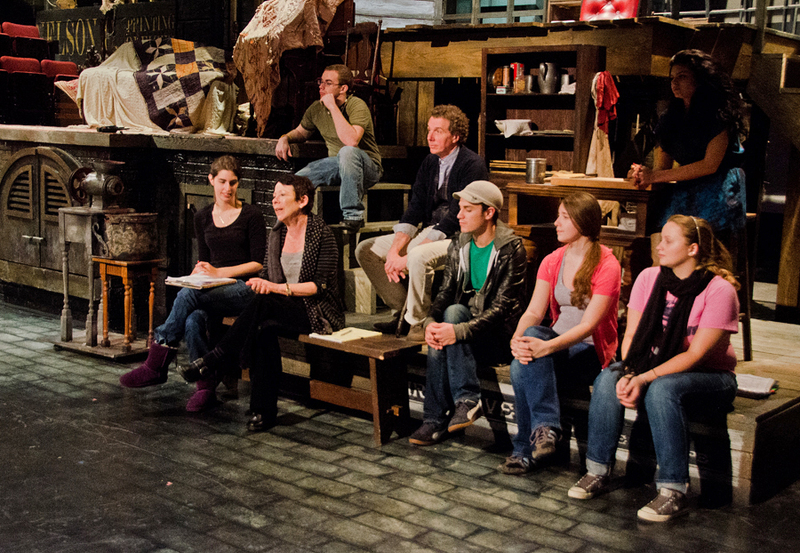 The crew involved in the Penn State theatre production of Sweeney Todd not only put on a matinee on Saturday, but some of them stuck around afterwards to answer audience questions for an hour. Director Susan Schulman, along with the stage manager, costume designer, lighting designer, scenic designer, and technical director, fielded questions about everything from how they get the blood off the actors’ clothes to how Sweeney’s wicked barber chair works to what was involved in getting the 1850s London accents right. 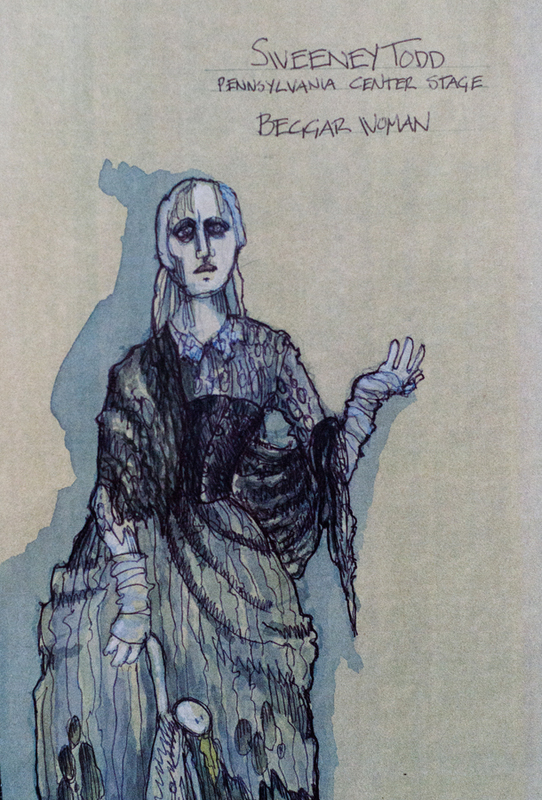 A sketch from the early stages of the show’s costume planning. A lot of the questions came from a group of two dozen young people sitting behind me, so when the session was over, I introduced myself to the group’s leader. It turns out that the students are from Cambria Heights High School in Patton, Pa., and they’ll be staging a version of Sweeney Todd in December. 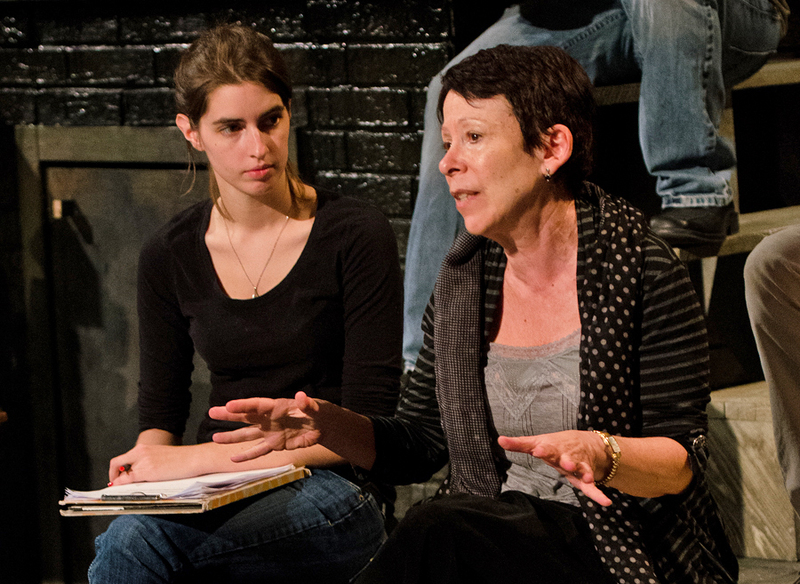 The group leader was Patricia Stiles ’80g, who’s the director of the show. —Trap door and chute. Sweeney Todd’s M.O., as you may know, is to get his victims into his barber chair, then slit their throats and send them sliding off the chair, through a trap door in the floor, and down a chute to the pie shop. Theatre student Ryan Stanger, who is the show’s technical director, was the guy responsible for designing the chair/trap door/chute operation. —Activating the trap door. A member of the crew is responsible for watching a video-surveillance monitor in order to know when the exact moment of a given murder is approaching. The stage manager (theatre student Kristy McKeever) actually “calls the cue” for a crew member to pull the level that opens the trap door, so the actor can disappear down the chute. Sweeney Todd stage manager Kristy McKeever (left) and director Susan Schulman. —Safety on the set. All of the cast and crew have to be extremely safety conscious around the trap door and chute. There’s a “chute call” every day, when actors have to practice safe operation of the chute. A red light in the back of the theatre is on whenever the trap door is open, to help ensure that no one accidentally tumbles into it. —The music. Sweeney Todd is a musical that typically has an orchestra pit of anywhere from 15 to 26 musicians, but in the Pavilion, all of that complex music comes from three people playing synthesizers. 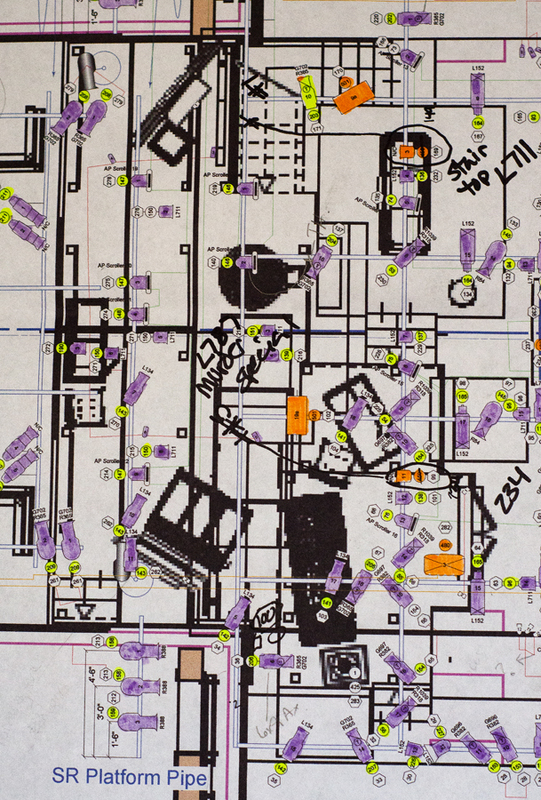 A small section of the lighting schematic for Sweeney Tood—enough to make your head hurt. —Stage blood. One of the Cambria Heights students asked the properties master, theatre student Jeff Maloney, how the “blood” works. (I’m sure I’m not giving anything away when I say that Sweeney kills a lot of people in the course of the show.) The student must know his props, because he asked, “Did you use a bladder?” Maloney said that, yes, Kevin Toniazzo-Naughton—the student who plays Sweeney—conceals a pouch containing 1.5 tablespoons of stage blood under his hand. —The “blood” is actually an expensive brand of stage blood called Reel (it’s known for being easier to wash out), mixed with laundry detergent and some water. —Razors. Maloney found the prototype for Sweeney’s razor and sheath at Sally Beauty Supply. The Penn State production of Sweeney Todd continues through Nov. 2. A number of the shows are already sold out, but tickets remain for a few of them, including the Halloween night performance. Entry filed under: Uncategorized. Tags: Cambria Heights, Charmian Hoare, Kevin Toniazzo-Naughton, Kristy McKeever, Patricia Stiles, Richard St. Clair, Ryan Stanger, stage blood, Susan Schulman, Sweeney Todd.